A bandaged Kate Schlag looks to set the mark at 2013 Club Nationals. Photo by Kevin Leclaire — Ultiphotos.com. During my six years of playing ultimate frisbee, I’ve been injured — to the extent that I can’t play — for almost two of them. And I’m sure I’ve spent even more time playing through injuries. 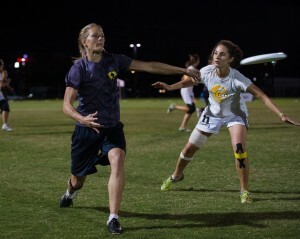 I’m not alone: while there isn’t any recent data on the extent of injuries in ultimate, I’d be surprised to meet a competitive ultimate frisbee player who hasn’t sustained at least one acute or chronic injury. I’m not going to argue that we run faster, jump higher, and go harder than other sports, but we do it for longer — eight hours a day, sometimes — and without the recovery awarded to other sports. A post-injury rehabilitation program incorporates many components, including surgery (in some cases), rest, physical therapy, strengthening, and conditioning. But what I see missing is a nutrition component. Critically ill patients who are admitted to intensive care units undergo nutritional therapy to promote healing — so why shouldn’t injured athletes, who are dealing with significantly smaller injuries, but injuries to tissue nonetheless — follow similar protocols? At the time of injury, your body launches an inflammatory response that mobilizes nutrients to help rebuild damaged tissues and lay down collagen. This mobilization is aided by certain hormones — like cortisol, catecholamines, and glucagon — as well as pro-inflammatory cytokines, that help initiate the net breakdown of skeletal muscle. Along with lipolysis, these processes provide enough glucose, amino acids, and free fatty acids to begin the healing process. These processes put an increased metabolic demand on the body, as more protein and nutrients are needed to act as substrates. Energy expenditure increases depending on the severity of the injury: long bone fractures, for example, may increase your basal metabolic rate1 by 15-20%.2 If your basal metabolic rate is 2,000 calories a day, that’s an extra 300-400 calories, though minus the amount you may no longer need because of exercise. Of course, many injuries are so mild that their influence on your basal metabolic rate is negligible; still, it’s important that you don’t cut out too many calories such that this net deficit starts to impede healing. A six foot, 185-pound, thirty-year-old male, for example, requires 1929 calories at rest — that is, to fuel his body’s organs if he’s sitting on a couch all day. Surprisingly, your muscles contribute only about 20% of your resting energy expenditure — organs like your brain, liver, kidneys, and heart eat up the majority of it3. Even if overall caloric demands are only slightly elevated after an injury, protein demands certainly increase during that time. Endogenous protein is broken down from lean muscle mass to be used as substrates, leading to losses in skeletal muscle. Without adequate protein, healing is hindered; studies have shown that the degree of this hindrance is directly proportional to the amount of lean muscle mass that is lost. Researchers haven’t yet reached a consensus regarding the optimal protein requirements for an injured patient, as it’s highly dependent on the individual and the severity of the injury. Some recommend up to 2 grams per kilogram of body weight to meet the increased demands of protein synthesis and the losses of amino acids that occur after injury. Focus on quality protein sources, just as you would following any practice, game, or tournament. Look to meat, poultry, fish, dairy, eggs, legumes, beans, nuts, and seeds, and aim to eat some protein at every meal or snack. In addition to getting adequate calorie and protein intake, the third component of a post-injury rehabilitative nutrition plan is ensuring adequate micronutrient intake. A 2013 study published in the Nutrition Journal found that trauma patients suffer from reduced plasma concentrations of micronutrients due to inflammation, increased requirements, and oxidative burden. Other studies that focus on burn patients and patients with head trauma reached similar conclusions, recommending that injured patients receive micronutrient supplementation. Again, while sports injuries tend to be significantly milder than these traumas, similar micronutrient supplementation strategies can be applied to the injured athlete. Ideally, a post-injury diet would include as many unprocessed, whole foods (vegetables, fruits, proteins, whole, intact grains, dairy, nuts, seeds, beans, and legumes) as possible and as few processed, inflammatory, and high-sugar foods (chips, cookies, muffins, white bread, processed meats) as possible. The nutrient density (the ratio of a food’s nutrient content compared to its energy content) of your diet is incredibly important following injury. If, for example, you decreased your total caloric intake without making any changes to your diet, your total nutrient intakes would decrease proportionately. But because injury puts your body in a state of micronutrient deficiency, it’s important to increase your micronutrient intake by eating more nutrient-dense foods and fewer empty calories. These four nutrients specifically target processes in the body that heal damaged tissue, which is especially common in ultimate injuries (torn ligaments, tendinitis, broken bones). Most also support the immune system, which can be suppressed following injury and is important in supporting the body through the healing process. This list is not exhaustive; it’s still important to eat whole foods with other essential micronutrients, like vitamins B and D, copper, calcium, and magnesium, as well as other compounds that research has suggested to be effective in healing, like bromelain (in pineapple) and curcumin (in turmeric). Zinc is an essential mineral that is involved over over 100 processes in the body. It plays a large role in supporting the immune system, helping with protein synthesis, wound healing, DNA synthesis, and cell division. Oysters contain the most zinc per serving (74 mg), followed by meats like beef, pork and chicken, fortified cereals, beans, and legumes. Vegetarians and vegans require a higher baseline intake of zinc, as vegetarian sources — like fortified breads and cereals and beans — contain phytates, which inhibit the absorption of zinc. Iron, another essential mineral, is a component of hemoglobin, which carries oxygen throughout the bloodstream to transport it to the cells in our body. Among other things, iron deficiency can lead to a depleted immune system, which hinders the body’s ability to recover from an injury. There are two types of iron: heme iron comes from animal sources like oysters, clams, mussels, beef, pork, and eggs; non-heme sources, which are not as readily absorbed by the body, include beans and legumes, whole grains, fortified cereals, and dark leafy greens. The absorption of iron can be increased by eating iron-rich foods with foods high in vitamin C.
Vitamin C is required to help form collagen, a protein that is used to heal wounds, form scar tissue, and repair and maintain the health of connective tissues and bones. Papayas, bell peppers, broccoli, strawberries, and pineapple all contain more than 100% of your daily recommended intake; oranges, kiwi, cantaloupe, cauliflower, and kale are also great sources. Vitamin A also plays a role in tissue health: it assists in collagen formation, helping wounds and tissue damage heal. It also helps support the immune system, which is often weakened after intense bouts of exercise. There are two types of vitamin A: preformed vitamin A, which is found in animal products, and provitamin A carotenoids, found in orange and yellow produce (sweet potatoes, carrots, and mangos) as well as green leafy vegetables and some beans. Provitamin A carotenoids are less bioavailable to the body, so vegetarians and vegans have to eat relatively more international units of vitamin A. Because different sources of vitamin A have different potencies, they’re often measured as retinol activity equivalents. For example, 12 micrograms of beta carotene (a provitamin A carotenoid) is required to form 1 microgram of retinol, because beta-carotene is not as readily absorbed as preformed vitamin A . Comments on "Nutrition And Recovering From Injury — Tips from the Research"